An aromatic body oil to help relax a busy mind. Sandalwood, Rose Geranium and Frankincense help unwind with their soothing and restful properties. Myrrh helps ease the mind, while Sweet Almond Oil deeply nourishes for beautifully supple skin. This aromatic body oil is best used in the evening to help relax and soothe. After your bath or shower, massage into skin in firm, upward movements towards the heart until fully absorbed. To intensify results, use after Soothing Bath Oil. Cocos Nucifera (Coconut) Oil, Glycine Soja (Soybean) Oil, Prunus Amygdalus Dulcis (Sweet Almond) Oil, Persea Gratissima (Avocado) Oil, Helianthus Annuus (Sunflower) Seed Oil, Pelargonium Graveolens Flower Oil, Boswellia Carterii Oil, Santalum Austrocaledonicum Wood Oil, Cananga Odorata Flower Oil, Commiphora Myrrha Resin Extract, Lavandula Angustifolia (Lavender) Oil, Linalool, Citronellol, Geraniol, Tocopheryl Acetate, Eucalyptus Citriodora Oil, Limonene, Melaleuca Viridiflora Leaf Oil, Pogostemon Cablin Leaf Oil, Benzyl Benzoate, Citral, Benzyl Salicylate, Farnesol, Beta-Carotene, Daucus Carota Sativa (Carrot) Root Extract, Daucus Carota Sativa (Carrot) Seed Oil, Ascorbyl Palmitate. This makes me feel good& let me take a deep sleep！ Also my family and boyfriend love this so sometime I gift this to them. I have trouble sleeping but whenever I use this oil, I get a restful night. This is my second bottle and I love it! It helps me unwind after a hectic day driven by a full time job, 8 year old son, husband, 2 dogs and aging parents! I have been using this for six months. Came across it by accident now I can’t live without it. I have osteoporosis and my pain sometimes is unbearable. At night on many occasions I feel the days strained muscles and bones. After a shower of the same make or bath then a nice massage of Soothing Body Oil is Magic believe. Don’t know how but it takes the pain away and helps to nod off into a relaxing sleep. I don’t know how they do it. I took it to my GP and he said it’s the ingredients and inside and the way it is used. So expensive yes! Is it worth it? YES!!! It is Magic as well as smelling nice healing, relaxing, soothing, skin softening. Can’t live without it. I love the smell of this and it makes my skin so soft. Expensive, and I’m not saying it’s not worth it, but I’d love to buy more, however just too pricey. A little oil does go along way. Bliss in a bottle. Divine smell and it does actually work. It does help me to relax and have a good night’s sleep after a busy day. I always take a bottle with me when traveling, it helps me to unwind. Absolutely blissful scent , the silky feel on the skin and how soft and supple it leaves my skin. 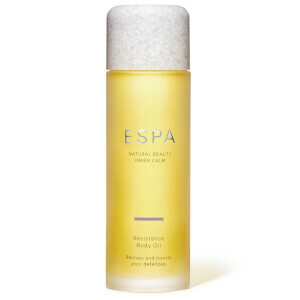 I treated myself to espa spa day with a masage at Christmas and the lady used this oil. I thought i have to buy a bottle to keep at home.